There are a number of robot arms available. We were able to find a used OWI-535 robot arm , but new ones can be purchased for between $30 and $60. For this project we wanted the robot arm to be mobile so we used duct tape to mount it on top of an Arduino car chassis . 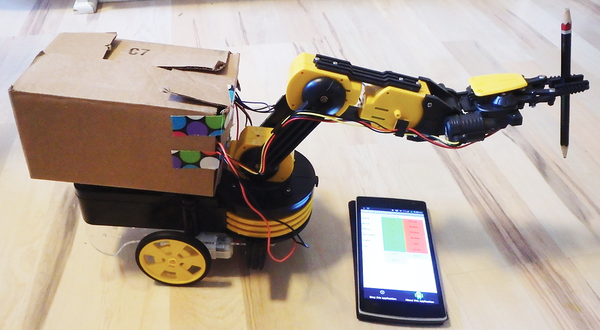 Figure 1: The motorized (cardboard killer) robot arm. 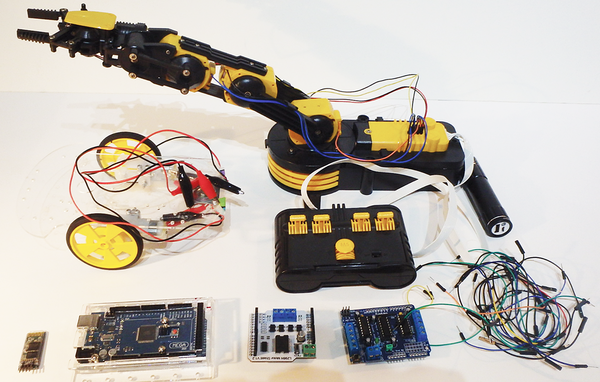 Figure 2: Key parts for the motorized robot arm project. Our biggest challenge was to figure out how to connect all the motors. Because the DC motors are bidirectional, we couldn't wire them directly to the Arduino pins. Instead we needed to use motor shields or some switching circuits. Finding a suitable motor shield can be hard. The lower cost shields are based on the version 1 libraries that use dedicated pin connects. Stacking version 1 shields will probably cause pin conflicts. The newer and more expensive shields use the version 2 libraries that use IC2 connections (SDA/SCL). This seemed promising but finding a version 2 motor shield that is both stackable and whose I2C address can be changed is difficult. Figure 3: The control circuit for the Robot arm. 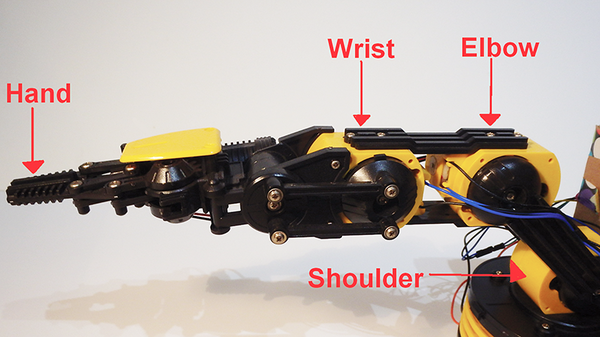 The OWI-535 has 5 motors to control the robot arm: hand, wrist, elbow, shoulder, and waist (Figure 4). We decide not to use the waist motor, instead we used the wheels to position the arm. Inside the robot's hand was a small light that we wired to pin 50. Figure 4: Robot arm joints. To power this project we found that a portable USB charger was enough. If however you find that this doesn't deliver enough power, the OWI-535 robot arm has a built in power pack with exposed connections. To make our testing a little easier we wired the robot motors to the 4-motor shield on top of the Mega module, and then wired the wheel motors to the "floating" motor shield. The 4-motor shield covered the default RX0/TX0 (0/1) pins on the Mega module so we wired a JY-MCU Bluetooth module to RX1 and TX1 on pins 19 and 18. Wire RX1 on the Mega to TX on the Bluetooth module, and TX1 on the Mega to RX on the Bluetooth module. The motor terminals on the car chassis are a little fragile, so rather than soldering the wires, we used alligator clips. We also duct taped the wires under the car chassis to keep them secure. The Arduino wiring was pretty ugly so we stuffed all the loose components into a small box. The box was duct taped to the back of the robot arm, and 2 cuts were made to feed the wires through them. For this project only one extra library is called – AFMotor.h. 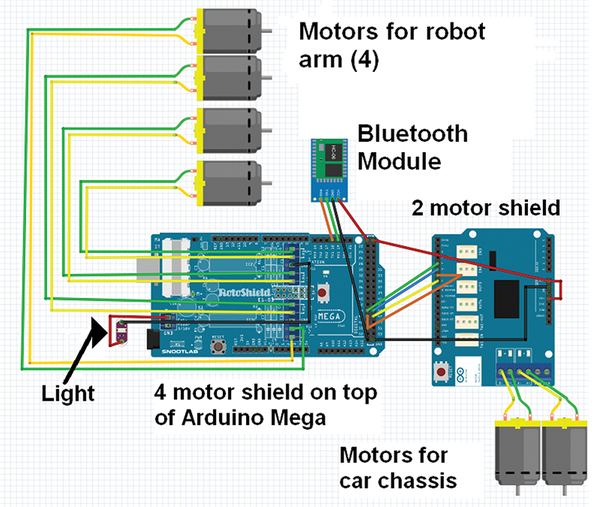 It can be installed from the AdaFruit Motor Shield Library . Rather than having lots of big if statements, we created two functions to simplify our code. The direction and speed of the wheels were controlled with the runwheels function. With this function we could set the direction of wheel 1 (M1dir) or wheel 2 (M2dir). HIGH would rotate the wheels forward and LOW would rotate them backwards. The wheel 1 speed (E1speed) and wheel 2 speed (E2speed) could be set to 0 for stop or 255 for full speed. In this project we only used full speed. To control the robot arm we created the function runmotor. With this function we passed the motor object motor1, and the direction as either BACKWARD or FORWARD. Unlike the wheels, which could run continuously, the robot motors were only moved for 250 milliseconds before stopping. To fully move a joint in the robot arm you would need to send the command a number of times. The full code is shown in Listing 1.